I’m lucky enough to have rhubarb growing in the garden, but if you don’t have any growing in your garden, it’s usually readily available in local stores. 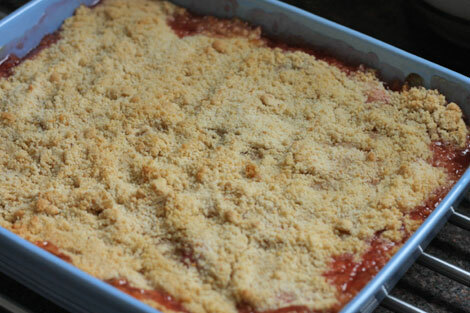 This rhubarb crumble recipe is very easy to make, especially if you use ready made crumble topping. 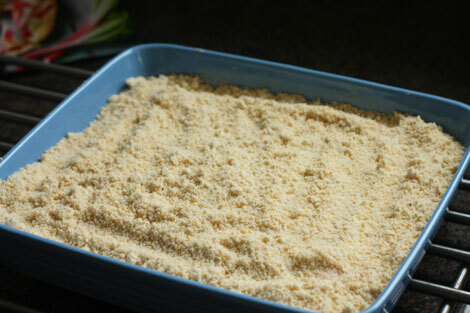 If you prefer making your own crumble topping, here’s a good recipe you can use. I hope you enjoy the rhubarb crumble as much as I did, and if you make it, please let me know how you get on. 1. 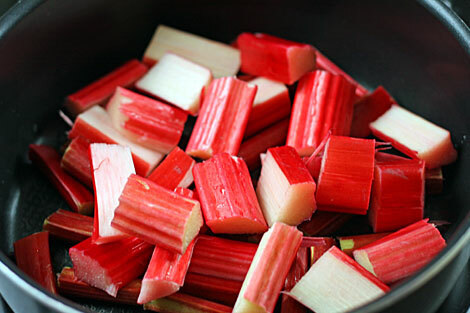 Firstly, chop the fresh rhubarb into chunks (each one should be about as long as your thumb), then add to a large pan. 2. 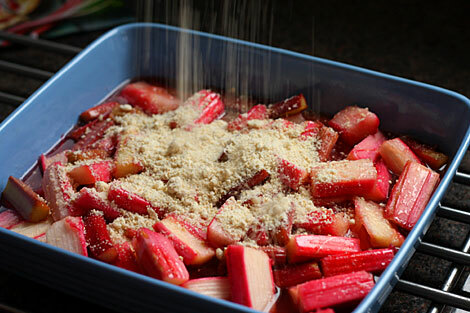 Measure out 100g golden caster sugar and pour it over the chopped rhubarb. 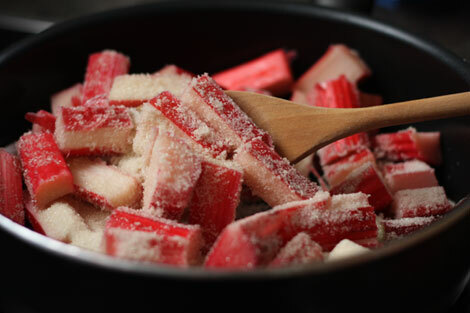 Give a gentle stir ensuring all the rhubarb is coated well with the sugar. 3. Cover and simmer on a very low heat for around 14-16 minutes. 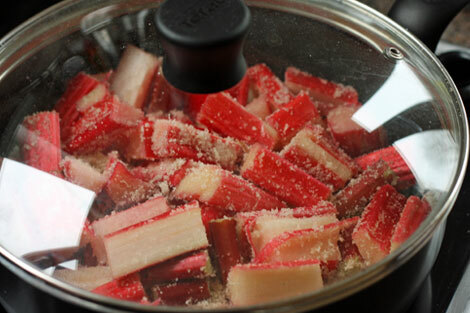 After this time, try a little of the rhubarb and add a little more golden caster sugar should you wish. 3. 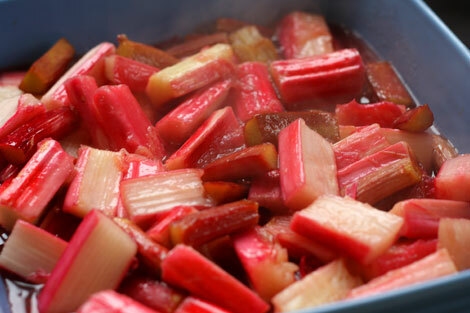 Once you are happy with the taste and the rhubarb is soft (and still holding its shape), transfer the rhubarb into a medium sized baking dish. Preheat your oven to 180C fan / 200C or gas mark 6. 4. Measure out your ready made crumble mixture on the scales (or if you prefer just add it by eye to the top of the cooked rhubarb). Everyone is different, some people like the crumble to be thick and crunchy, whilst others prefer it to be thin and gently crisp. The choice is entirely up to you. 5. Once you are happy with the quantity of topping on your dish, gently smooth down any areas where you may of put too much crumble, ie you want the crumble to have roughly the same amount of thickness all over. 6. When you are happy with the look of your crumble, pop it into the preheated oven (middle shelf) and cook for around 25-30 minutes or until the crumble topping is a nice golden colour. Remove from the oven and let it cool slightly on a rack. Be warned…even though the crumble will look wonderful and smell amazing, don’t be tempted to get your spoon in it straight away as it will be piping hot! Some people enjoy eating their rhubarb crumble with warm custard or even vanilla ice-cream, however I just prefer it by itself. Happy Cooking! Thank you to Carole Thomas for this recipe.